Employers are increasingly concerned by the impact of employee health on performance, suggests report by Aon. Both physical and mental health issues are moving further up businesses agendas. Employers are increasingly concerned with the affect of health on performance, with 96 per cent of employers claiming they can see a conncetion, that is according to a report by Aon Employee Benefits, the UK health and benefits business of Aon. The survey of 200 UK organisations also shows that health and wellbeing is rising up the corporate agenda, with 96 per cent of employers either agreeing or strongly agreeing that they are responsible for improving employee health behaviours. Indeed, 77 per cent are looking to improve on their existing health and wellbeing programmes in the next 12 months. Concerns over wellbeing are particuarly high among the globally mobile population. Interestingly, although employee physical health is important to employers, they are also looking to strike a balance between what are becoming the four widely accepted core pillars of health and wellbeing – emotional, physical, social and financial. Physical and social wellbeing programmes are the most commonly adopted strategies, although Aon believes this may be partly attributable to longer standing workplace initiatives such as health & safety, occupational health or community/charitable projects forming the backbone of a strategy. 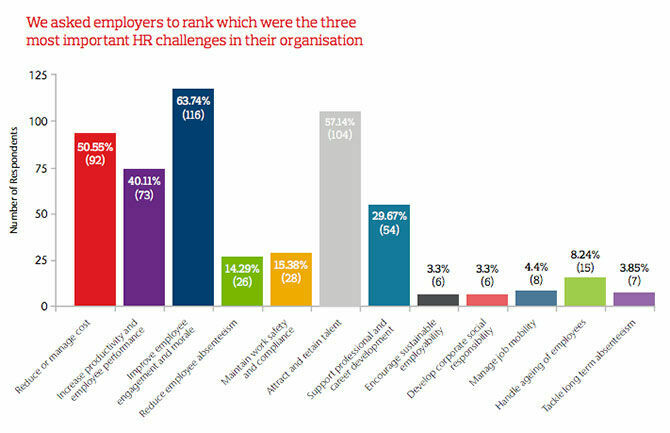 Aon’s survey suggests employers will continue to develop and refine these programmes in the year ahead. The survey also showed that 43 per cent of employers are looking to evolve their emotional health offering to support mental health issues further; this is showing high levels of considered activity and is no doubt fuelled by the widespread media coverage on this issue in the last couple of years.Earlier this year, Relocate had a look at how mental health affects those on international assignment as stress levels continue to increase. If left unchecked, it can result in individuals returning home and the failure of the assignment or relocation.A significant number of employers (53 per cent) are looking to improve the support available to employees through financial wellbeing initiatives, recognising the importance of this maturing theme in its own right but also perhaps acknowledging the established links between financial, emotional and physical wellbeing. Which are the top destinations for international expansion? Publishing data relevant for global talent and HR managers, the Association of MBAs (AMBA) welcomes the increasing numbers of women on MBA programmes, but says more progress is needed.